As the world's youngest country enters its third year of civil war, there are new hopes for a durable peace. The news out of South Sudan over the past two years has been devastating. And as we mark the beginning of the third year of conflict, the risk of famine and further atrocities remains grave. But not all the news is bad. In 2015, a peace agreement was signed following increased regional and international efforts. The coming year has the potential to see that peace consolidated — if the country’s leaders follow through. A Peace Deal Signed – It took immense international effort and far too long, but in August 2015 the Compromise Peace Agreement was signed laying out a road map for democratic transition. 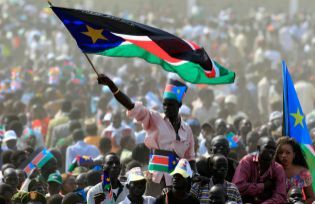 Key to the deal is a power-sharing arrangement in which rebel leader and former Vice President Riek Machar returns to the capital Juba as a deputy in a 30-month transitional period leading up to new elections. Famine Averted – UN agencies have released dire warnings of looming famine, including as recently as October. Thanks to an outpouring of international aid and continued pressure for humanitarian access, the worst has been avoided. Still, the International Committee of the Red Cross warns that hundreds of thousands of people in South Sudan still face “severe food shortages and an alarming hunger situation.” International efforts have prevented the situation from being much worse and are worth celebrating. But they should also serve as a reminder of what failure to implement peace can mean and thus help to ensure that such emergency efforts do not need to be repeated. Security Arrangements – One of the first signs of progress in implementing the peace agreement was the beginning of removal of government and government-allied Ugandan troops from the capital Juba. In order for a transition to take place, a whole series of steps must be taken — from removal of remaining troops outside of Juba to the formation of Joint Police Units and disarmament and demobilization of troops. As stated by former U.S. Special Envoy to Sudan and South Sudan, Princeton Lyman, a key first step will be strengthening the Ceasefire Transitional Security Arrangements Monitoring Mechanism and UNMISS to ensure international monitoring prevents a return to conflict at the fragile early stages. Accountability, Hybrid Court – An essential part of the peace agreement was the establishment of a hybrid court to ensure accountability for the atrocities committed during the conflict in South Sudan. There has been no progress on this point so far and if there is to be reconciliation and peace that works this will be needed. A first step will be appointing a head of the Hybrid Court. Daniel P. Sullivan is the director of policy and government relations at United to End Genocide.